You will need to have downloaded your raw DNA data from the original testing site. The MyHeritage Blog has a link to lead you through the upload process. I’ve uploaded my DNA data from my test to this site. 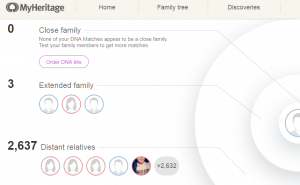 Uploading to multiple sites is a way to potentially reach more DNA cousins and make more research connections. Of course not all people respond. You will have access to all currently available features of the DNA section of the MyHeritage site, including the chromosome browser. That information can then be used to “paint” your DNA at sites like www.dnapainter.com. Do you need a subscription to My Heritage after uploading your DNA to get continued updates? The current DNA features will remain free. I’m assuming there will be additional features added that will require a paid subscription.